‘Bazri’ is a very important part of RCC and concreting. The strength of the structure depends on the qualities of Bazri. When you take the supply of Bazri, you should ensure that the quality should be according to the specifications which can be obtained by the laboratory test. Generally ‘Bazri’ should be of hard, tough dense stone or from river bed single pit gravel. It should be free from vegitable matter, other impurities, deleterious substances etc. Generally you can judge the quality of ‘Bajri’ in the field as mentioned below. 1. Bazri should be free from lumps of earth, grass, decayed vegetation, silt and sand particle etc. 2. In some ‘Quarries’ there is Katcha stone in Bazri which generally has reddish or yellow reddish color. When you rub these Bazri particles, the particles are easily broken. This material is cheap in the market. 3. Bazri should be screened having minimum sand contents or fine material. 4. Bazri should be free from mixing with earth. This happens in rainy season when the Bajri gets mixed with earth or has slush coat on it. 5. You should be cautious as the supplier/truck owners have tendency to supply inferior quality or less quantity of the material. The Loss in material may be in two ways which are mentioned below. The Supplier/Truck owner may supply Bazri below the specification such as Katcha stone Bazri, unscreened, mixed with earth, other impurities and slush coating. This type of Bazri is cheap at ‘Quarry’ site/source of supply. The strength of RCC may reduce by 10 to 30 % if the ‘Bajri’ below specification is used in construction. The following precautions should be used while procuring the material from the supplier. These may help you save upto Rs.1000 or more per 1000 Cubic feet truck. Watch out for the sub standard material. Even if the supplier tells you that he has carried the best material you should check the quality using the guidelines above. a) About Rate: You should collect rates from around 3 to 4 suppliers. You should also collect the rates from few truck owners who stand their trucks full of material at the early hours of the day in every city/town. This exercise will not only help you get good quality material but will also help you figure out the prevailing rates. b) About Measurement (Wrong Calculation): The supplier or truck owner may try to used incorrect calculation method while calculating the final payment. For example if the measurement is 3 feet 6 Inches, he calculates the payment by multiplying 3.6 to the rate where as he should have used 3.5. The suppliers measure the height of the truck while calculating the material quantity being supplied. b) Never take the measurement of the material at the ground after unloading as this will distort the calcualtions and you will end up paying more money. d) Try to get the material in cash terms and make the payment after measuring the height, length and breadth. As the truck driver/owner usually charge less rates on cash payment but don't forget to get a bill. Even though Bazri is cheaper compared to cement, it still is very important as far as the strength of the structure is concerned. Hopefully these guidelines will help you get the best out of your suppliers. 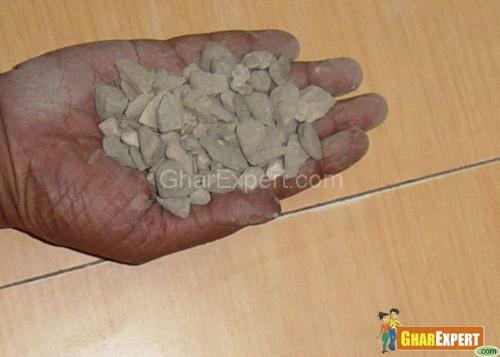 Coarse Aggregate consists of crushed, uncrushed or broken stones. Check the grading of sand for proper sizes.